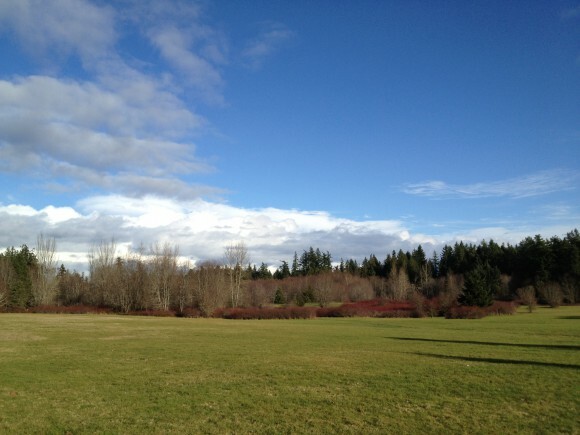 Spring arrives on Bainbridge Island and the real estate market is in full gear. Island Center Hall on Bainbridge. 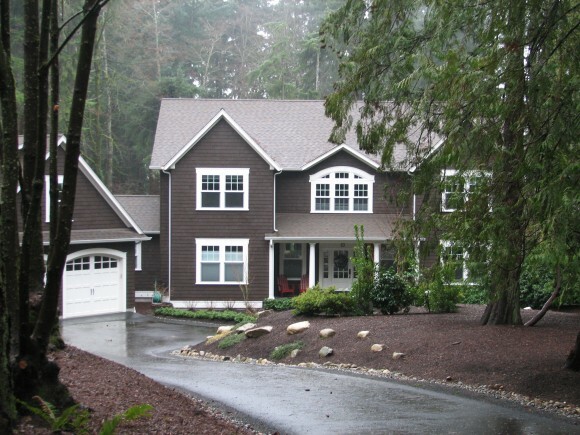 Over the first three months of 2008, 34 homes sold on Bainbridge Island. The next year, 37 sold in the first quarter. By 2012, first-quarter sales rose to 55. How many this year? Eighty. That is 45% higher than last year (which we felt was pretty good at the time). The last time we experienced this amount of volume was in 2005, when we sold 87 homes in the first three months. Condominiums bottomed out in 2009 with five first-quarter sales, and we almost tripled that number with 14 this year. So are we done? Are we through with the great real estate correction of 2007, 2008, 2009? On the surface, one would surmise this (as confidently as one could after the correction that pretty much obliterated our ability to predict upcoming trends), but it really hasn’t settled in across the board. If we are done, why has the average price of homes sold for the first three months dropped 21%? Even the median price, which is less volatile, has retreated. What gives? Our home sales over $1 million have struggled, and those sales have a tremendous impact on our statistics. 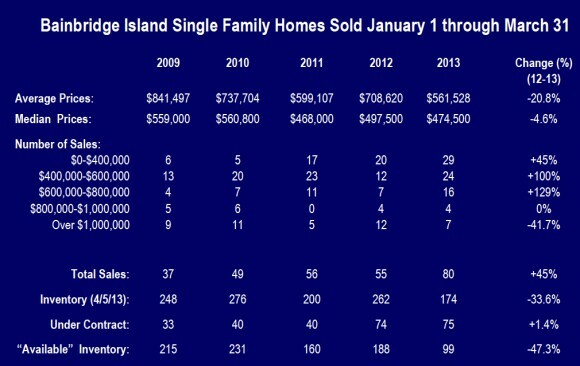 We sold 12 homes over $1 million in the first three months of 2012, four of which sold for more than $1.5 million. This year, we are at seven sales, only one over $1.5 million. It is difficult to say with authority why one segment of the market might be struggling, but we can say it is at least partially due to low inventory. There are currently 26 homes listed above $1 million (four of which are under contract to be sold). Last year there were 51 listings on April 15, of which 15 were under contract. In 2007, there were 71 listings in mid-April. As it often happens, when the inventory gets low, buyers wait. Waterfront and high end homes are trailing in the market right now. Low inventory is one explanation. In truth, our numbers might have been even better as our general inventory has been at historic lows all quarter. Where are the sellers? There are a number of reasons for sellers to wait and they usually revolve around price. However, new listings have fared very well in recent months. We saw 131 homes come on the market in the first quarter and only six have been withdrawn. Of the rest, only 44 remain on the market (24% have already closed and 51 are under contract)! If you look at the stat sheet, you see that the distribution is much more balanced along the price ranges (except for the over $1M) than in the past number of years. Even the $800-$1M segment has surged with 13 homes under contract at the time of this writing. This is a very difficult question to answer with statistics, and needs to be viewed from “indicators” versus hard numbers. Different parts of the market are experiencing different pressures on prices. One indicator is price-per-foot within a price range. In the up-to-$500K range, the average price per foot has increased from $186/ft. in the 1st quarter 2010 to $207/ft. this year. From $400K-$800K, the trend is less conclusive, from $198/ft. in 2010 to $203/ft. this year. One might conclude that the higher the price, the less the appreciation (if any). Other indicators of an upward movement are that fewer deals are failing, there are more multiple offers and homes new to the market are selling. Together, these signs point more to a sellers’ market (which is accompanied by rising prices). All that being said, it will be a long road before we see prices close to our 2007 peak. Vacant land can equal more possibilities for buyers not able to find exactly what they want to purchase. Another bright spot is land. We have seen 10 sales this year versus just five last year. All but one was less than $400,000. Building permits issued are up 48% from last year! Developers are still very cautious. Financing for speculative houses is extremely tough (you might say almost non-existent). At current price levels, there is considerable risk to re-coup costs (to say nothing of making a profit). Nevertheless, builders are more confident and active. Even with our lower inventory, one has to view our first quarter as a success. Other than properties priced over $1 million, the market has been brisk and generally balanced. We are seeing an influx of new people to the island (last year 55% of all buyers came from off-island) in all price ranges, which improves our diversity. And in all honesty, we cannot see too many clouds on the (at least short-term) horizon! Blossoms are here and even the sun is showing its face. 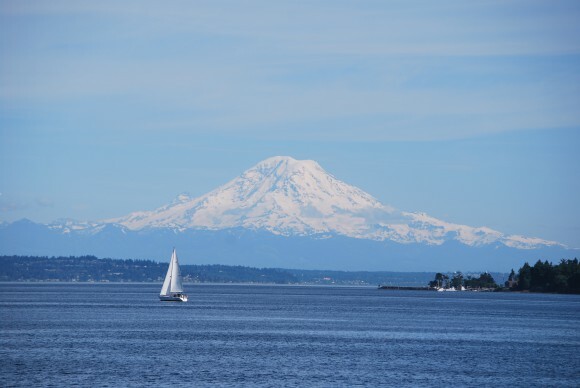 Without a doubt, Bainbridge is one the best places in the world to enjoy the spring! Spring is here and for our little family that means busy weekends with sports for the kids, coaching for my husband and work for me. 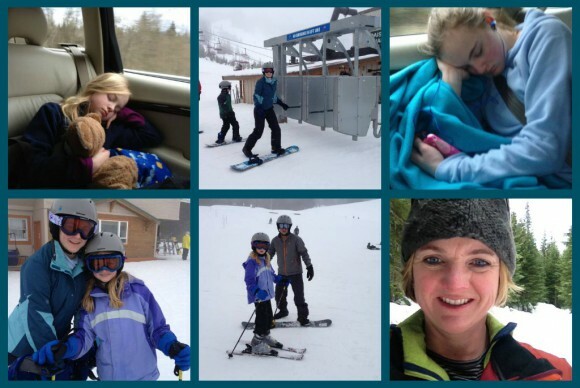 So, this past winter we tried to do some exploring and get a little R&R in before the busy season started. There is A LOT to do within 2-3 hours of Bainbridge. We have barely scratched the surface. But since the new year, we have explored Leavenworth, Cannon Beach, and Steven’s Pass (a few times) for skiing. This summer we can’t wait to trek down to Sun River Oregon (a little further, but in June, a great place to escape the June gloom of the coast). We stayed at the The Sleeping Lady and can’t recommend it enough. The food is to die for. Worth the drive alone. It is gourmet buffet . . .meaning you will need to do a lot of skiing during the day. It is healthy, organic, and amazing. We also enjoyed the quaint lodging, the Chihuly glass sculptures, and the nordic skiing trails. On the way home we skied at Steven’s Pass Ski Resort. Their ski school is terrific for younger kids. We will certainly return to the Sleeping Lady for another long weekend. For another long weekend we headed south to Cannon Beach. 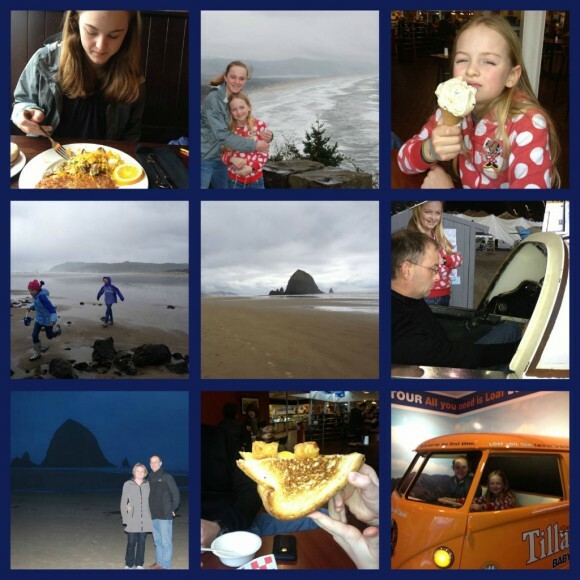 We have been to Seabrook a few times, but had never ventured to the Oregon Coast (not with the kids anyway). It was time. We stayed at the SurfSand Resort, which has great service and is right on the beach, but the hotel is a little tired. I scoped out some great vacation homes for next time. The town of Cannon Beach has a lot of shops and MANY great dining options. The weather was wet and gray (this is the PNW, right), but we still got in walks, beach time and got to connect with some Bainbridge friends down in Arch Cape. On one of the really rainy days we went down to the Tillamook Cheese Factory and ate some more! This has been a banner ski season, so we have escaped a few times for skiing and snowboarding at Steven’s Pass Ski Resort. They are actually having an extended season right now! 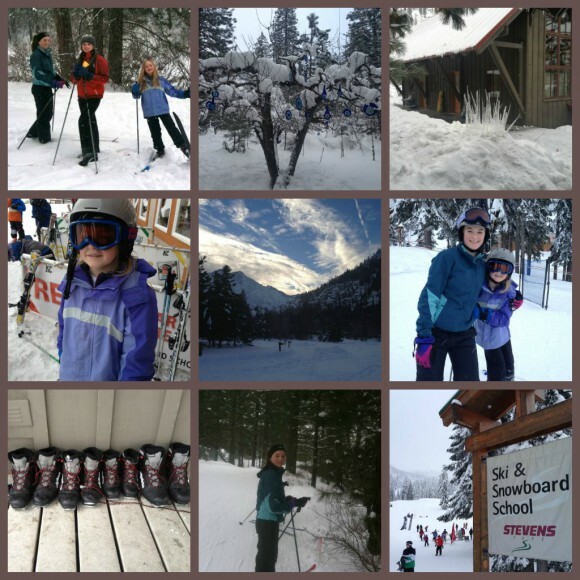 The Steven’s Pass Ski School has a great system for kids and this last trip I tried out their nordic trails too, which are five miles from the main resort via a shuttle. The trails are serene, well groomed and challenging. They have miles and miles of nordic trails and dedicated snow shoe trails too. 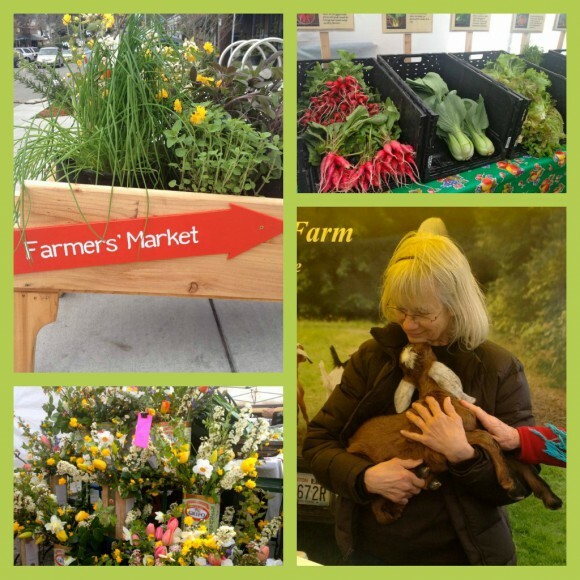 Yesterday marked the opening day of the Bainbridge Island Farmer’s Market 2013 Season. From 9am -1pm on Saturday mornings you can find locally sourced food for sale at the Town Square at City Hall. 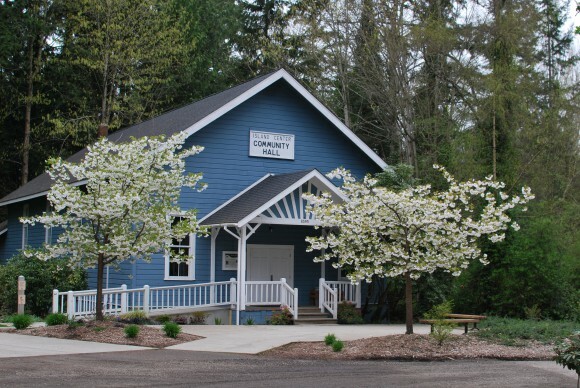 The market will run through November 16th before it moves indoors to the Eagle Harbor Church. New this season are Bainbridge Island BBQ and Via Rosa Italian Market, amongst many other vendors new to the open market scene. The market has a wide variety of options for breakfast or lunch while you are shopping. Clara’s Wok is a family favorite for pot stickers. Like last year, local chefs will also be doing cooking demonstrations. Make the market part of your Saturday routine, bring your shopping bag and load it up with fresh produce and local goods. I love the greens from Leap Frog Farm and the goat cheese from Port Madison Farm is a great pairing for your salad. I can never really pass up the amazing flowers and I can’t wait for warmer weather and tomatoes . . . 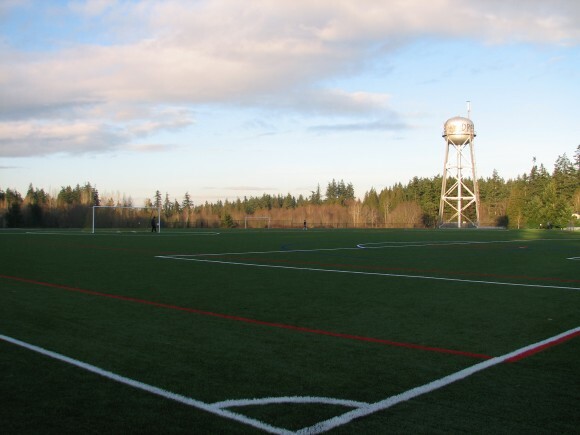 The newer turf soccer fields at Battle Point Park. The Battle Point Neighborhood is to the south of Battle Point Park itself, and the Arrow Point Neighborhood includes the park and is primarily to the north. If Battle Point Park is not enough there are miles of trails in the nearby Grand Forest and the Ferry Dell Trail, which winds down to the water. Homes nearby are custom and of high quality. Many homes are on acreage, and there is no one “development” type neighborhood. 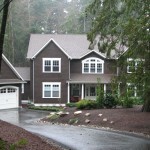 Many homes are waterfront or have a view and many are in very private, wooded settings. The park and waterfront opportunities attract many buyers, and there are a wide variety of homes and prices to suit many price ranges. 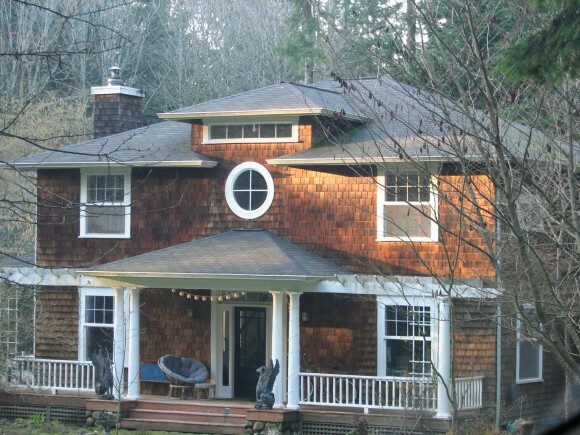 A home on North Tolo on Bainbridge Island. 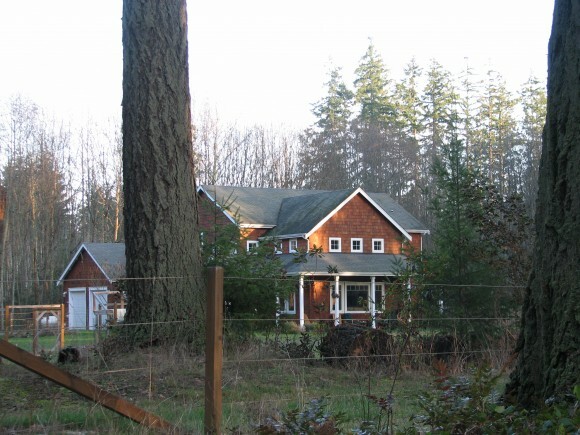 A home on Battle Point Drive on Bainbridge Island. 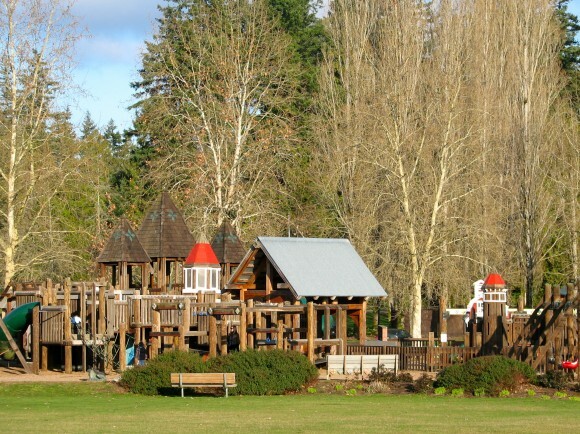 The Play Structure at Battle Point Park. 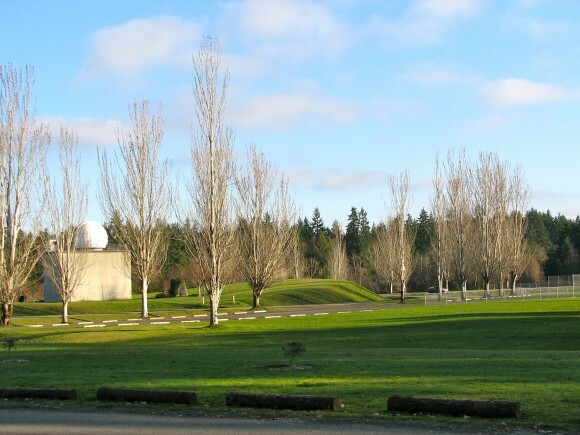 The Ritchie Observatory at Battle Point Park. A newer custom home off Battle Point Drive, built by Rick Debarros.